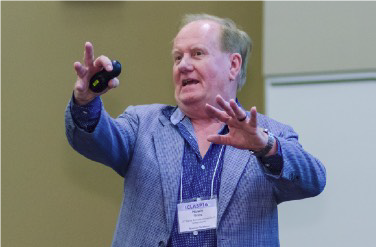 At the International Association of Language and Social Psychology 16-Edmonton conference, our own Dr. Howie Giles was celebrated for his career accomplishments. His presentation took an innovative look at his research, including examples of theorizing that did not seem to “take” at the time, but might be reconsidered now. His talk was followed by tributes by outstanding scholars and friends. The newsletter (click here) provides a detailed story on the presentation (pp. 5-6), ending with “Thank you to Howie, and to everyone, for inspiring work and friendships that contribute to the betterment of humanity.” The attached photo from the newsletter shows Howing casting his magic spell. Howie Giles Ph.D., D.Sc., is Director of Volunteer Services, Santa Barbara Police Department; Distinguished Research Professor, Communication, UC Santa Barbara, USA; and Editor & Co-Editor: Journal of Language & Social Psychology & Journal of Asian Pacific Communication.